The laundry room can be the culprit of serious toxins that create skin irritations, respiratory issues, and hormonal changes. Do you know what chemicals are hiding in your laundry room? It's okay if you don't. It's our job to know them. Today, we aren't going to bore you with chemical compounds and research. We are going to talk about an alternative to the synthetic soaping agents: the soapberry. Soapberries/Soap nuts (Sapindus Mukorossi) – are native to Nepal and India, found as fruit from trees in the Lychee family. You may have heard them referred to as a soapnut. This is deceiving because this little berry is actually a fruit and NOT a nut; but they are the same thing! We will continue to refer to them as soapberries as to reassure anyone concerned about nut allergies. Fear not - it is a fruit! The husk of the soapberry contains pure saponins. These saponins are nature's purest form of soap and an all natural organic surfactant or soaping agent. Used for centuries around the world, the soapberry not only cleans, but also possesses natural fabric softening capabilities. The natural surfactant lowers the surface tension of the water and allows the water to penetrate and lift dirt, grime, and oil. Without the use of carcinogenic and volatile substances like sulfates, phosphates and other toxic agents found in most commercial detergents, we harness the pureness of the soapberry. 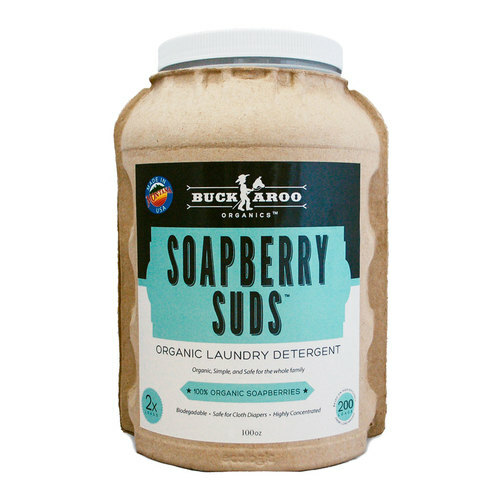 We use certified organic soapberries in our Soapberry Suds™ organic laundry detergent, that are imported from their native lands in the Himalayas. Once the husk is de-seeded and dried, we are able to powder it and add a few other natural elements to boost the power of the saponins and keep them effective in both hard or soft water. 1. 100% hypoallergenic and designed for sensitive skin. No enzymes. No optical brighteners. 2. Cost effective and eco-friendly . 3. Chemical FREE. Biodegradable. Better for your health and the environment. Soapberries are designed for High Efficiency machines as the saponins are low- sudsing by nature! Also, did we mention our detergent is cloth diaper safe? Well, it is! There is no residue left behind or plant-based oil derivatives. Soapberries have even been used in medicines to treat eczema and psoriasis. It is hypoallergenic and perfect for those with sensitive skin. Don't forget to check out our free samples online! You can order 2 free samples to try for yourself! Have you ever used soapberries or soapnuts? If so, we'd love to hear your experience. Share your comments below. Now, let's get you on your way to a less toxic laundry room! Our Laundry Starter Kit is a perfect way to sample and save a few bucks! a great way to try out our Soapberry Suds and Wool Dryer Balls. Learn more about our Wool Dryer Balls. Don't forget to sign up for our newsletter for more tips, exclusive offers, and discounts! Older Post5 Mommy Hacks to Clean, Stress- Free Eating on a Budget.